They sent me 10 media images… and I could not get a handle on this exhibition. They sent me the superlative catalogue… and still I could not visualise this exhibition in my mind. 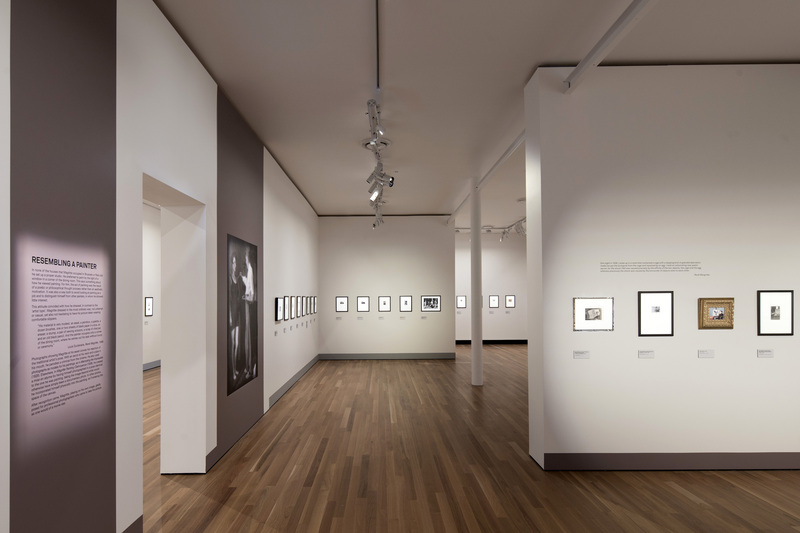 Only by going and actually seeing this impressive exhibition in the beautifully refurbished spaces of Latrobe Regional Gallery do you really begin to understand its sangfroid – that Magritte’s photographs are a hyper-reality take on the mystery of the everyday, accomplished by the artist altering the very conception of what a photograph is. Please note, I have included several juxtapositions in this posting which illuminate the pairing of photograph and small reproductions of Magritte’s painting in various sections of the exhibition for which I did not have the media images. This is because the reader can not get a good idea of the exhibition otherwise, and so I use these images under “fair use” conditions for the purposes of academic review, and to ensure that someone who cannot actually see the exhibition can begin to understand its import. Small, often tiny photographs, usually no more than 2.5″ x 4″, are double mounted (which adds to the concentrated focus on the image) in black frames. Collectively, these images possess a certain aura and intensity while individually they exude a wonderful presence. Some photographs are toned, some not; some have irregular edges (as though cut from something else, some other fabric of time), others have deckled, wavy edges. Some photographs are cabinet cards, others carte-de-visite, or gelatin silver. Some of the photographs are so small, for example one titled The Earthquake (1942), and Dissuasion (1937) that you can hardly make out what is going on in the image. But then between these two small images is a slightly larger photograph titled The Feast of Stones (1942) where René Magritte, Paul Magritte and Marcel Mariën are eating bricks! There are portraits of friends and wives, there are serendipitous photographs or, more often, elaborately staged performances for the camera. They form an impressive body (which isn’t a body) in the gallery space. Throughout the gallery some of the small photographs are printed large on canvas and these add a vital counterpoint for the eye, amongst the ocean of small images. Further, the exhibition then “…assists the viewer in connecting the images with Magritte’s art by hanging alongside small reproductions of key paintings framed in gilt baroque frames.” Small reproductions of some of Magritte’s paintings are housed in elaborate, wide, heavy gold frames hung between some of the small photographs, but the reproductions are poor and the elaborateness of the frames quite overrides the reproductions themselves. This is a jarring note in an otherwise excellent exhibition. The scale of the reproductions sets up a correlation between the physicality of the small photographs and that of the paintings which in reality does not exist. The paintings are much bigger and their surface texture – their flattened almost non-existent brushstrokes – are totally lacking in the reproductions. While there are only two Magritte paintings in institutional collections in Australia (The Lovers (1928) at the National Gallery of Australia and In praise of dialectics (1937) at the National Gallery of Victoria), this exhibition cried out for at least a couple of “real” Magritte paintings amongst the photographs, so that the difference and similarities of aura and physicality could be compared between the two. Whether a loan of both paintings was too expensive in terms of insurance and security I am unsure, but they needed to be there. 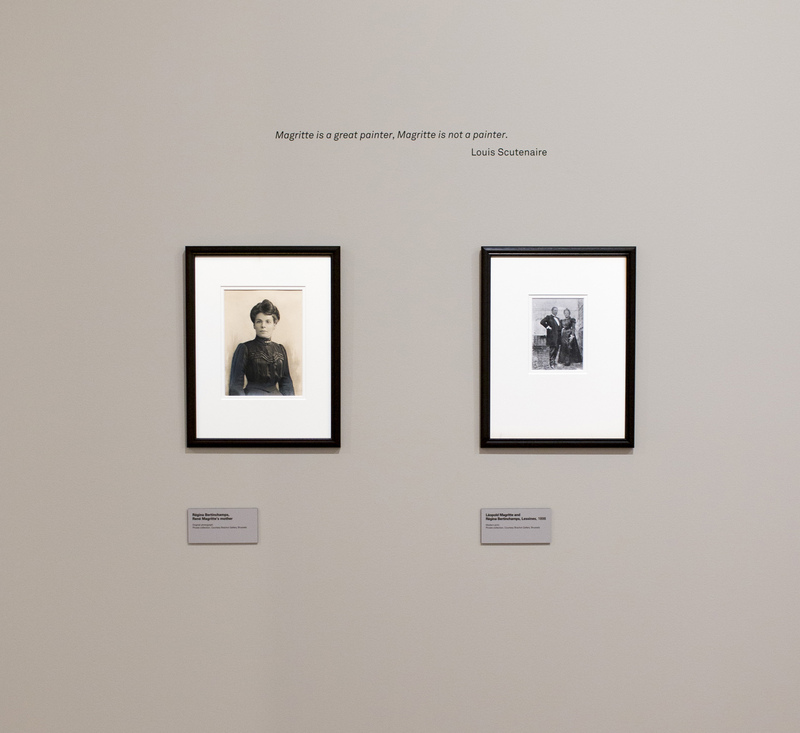 One of the first juxtapositions in the exhibition is a reproduction of Magritte’s painting The Lovers (1928) which is sequenced with his photograph, The Bouquet (1937) and a still from Sergei Eisenstein’s film Battleship Potemkin (1925) in which sailors, comrades all, are covered in a tarpaulin and just about to be shot. While most juxtapositions of photograph and painting in the exhibition illuminate the symbiotic relationship that existed between both (did the photograph influence the painting or was it the other way round? when the photograph exists as an art work in its own right but challenges through a twisting of reality the very notion of a documentary photography, are the chicken and the egg, the painting and the photograph, existentially linked? ), this initial juxtaposition seems a little forced. Indeed, in the excellent beautifully produced catalogue the principal curator (Xavier Canonne), notes that the juxtapositions, “… are suppositions based on an interplay of analogies. If Magritte was aware of them, he would no doubt have rejected them, preferring to see them as fortuitous coincidences. It nonetheless remains that the universe of the mind is full of borrowings whose origin often remains unsuspected; exemplars buried in memory crop back up and recompose themselves through association.” Perhaps this was not the best example to begin the exhibition, with a painting of two people attempting to kiss each other through their grey cloth linked to comrades about to get shot. 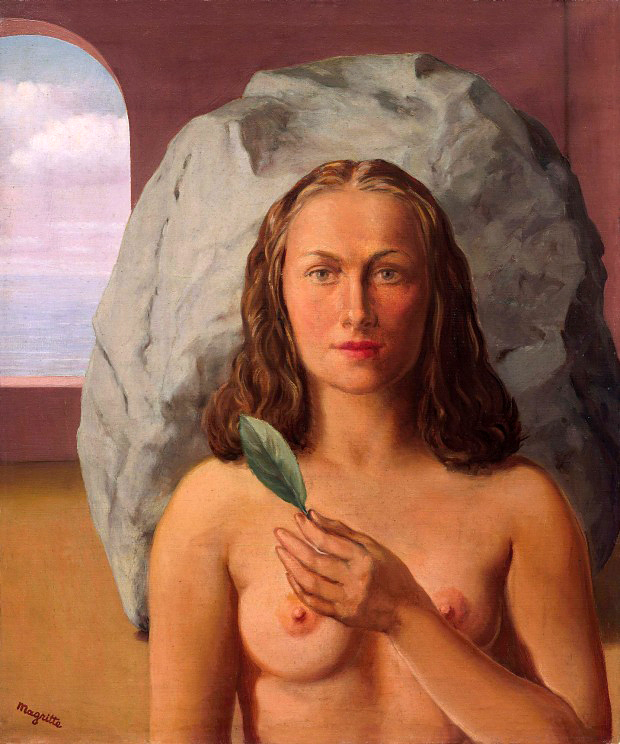 An example of this is Jacqueline Nonkels supervised, staged, photograph Rene Magritte painting Clairvoyance 4th October 1936 depicts Magritte painting Clairvoyance only for the painting to repeat the gesture of him painting in the photograph. Go figure – literally! 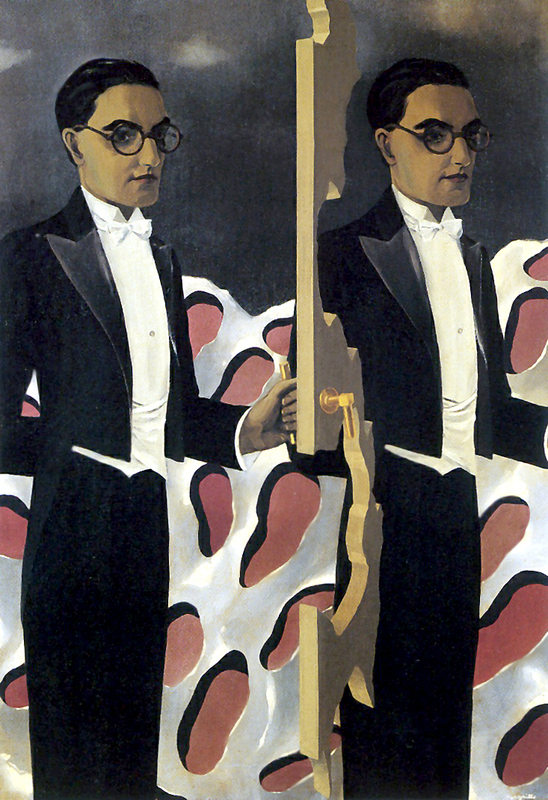 Next to the small photograph is a reproduction of the painting Clairvoyance (1936) and Canonne observes that the self-portrait has become as much mise-en-abyme (placed into abyss: the visual experience of standing between two mirrors, then seeing as a result an infinite reproduction of one’s image; or the Droste effect, in which a picture appears within itself, in a place where a similar picture would realistically be expected to appear) as anything else. By subverting the documentary reality of photography it becomes something else and in so doing, becomes an intrinsic work in its own right. This transformative representation can happen within one image, or in a sequence of images, such as the pairing of the three forms of Love: the photograph Love; René Magritte painting ‘Attempting the Impossible’; and the painting Attempting the Impossible (all 1928, below). 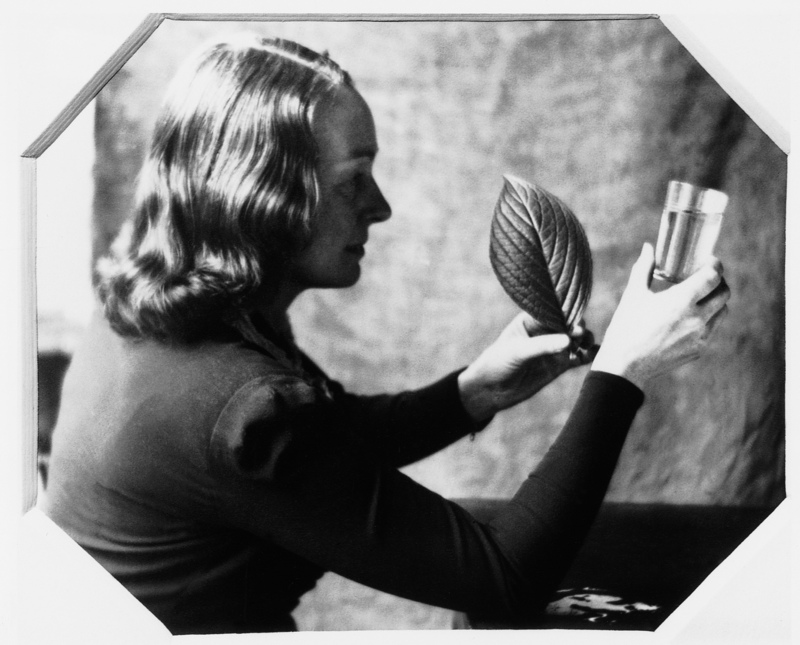 Other examples in different sections throughout the exhibition include The Oblivion Seller (1936), a small photograph from 1937 which is sequenced next to a reproduction of Magritte’s painting of his wife, Georgette (1937); or the photograph Rene Magritte and The Barbarian (1938) which is sequenced with The Flame Rekindled (1943) and a still from Ernst Moerman’s surrealist film Monsieur Fantômas (1937). I feel that these tiny, tiny portraits are about extending the possibilities of the image through the joy of living. To play, to have fun with friends, to travel to places, to talk about ideas, about art and love and life, to debate the titles of images and paintings with comrades. In this regard, the interwar period and the avant-garde was immensely creative in terms of an investigation into the multiplicities of the world. The photographs are a reality take on the mystery of the everyday, a counterpoise to the severity and austerity of Magritte’s paintings. Paraphrasing Alfred Gell, who was recently quoted by Zara Stanhope in an essay on the cultural agency of photographs, I believe that not only do works of art “have the power to act and to influence others”1 they also have the power to act and influence each other through human agency. 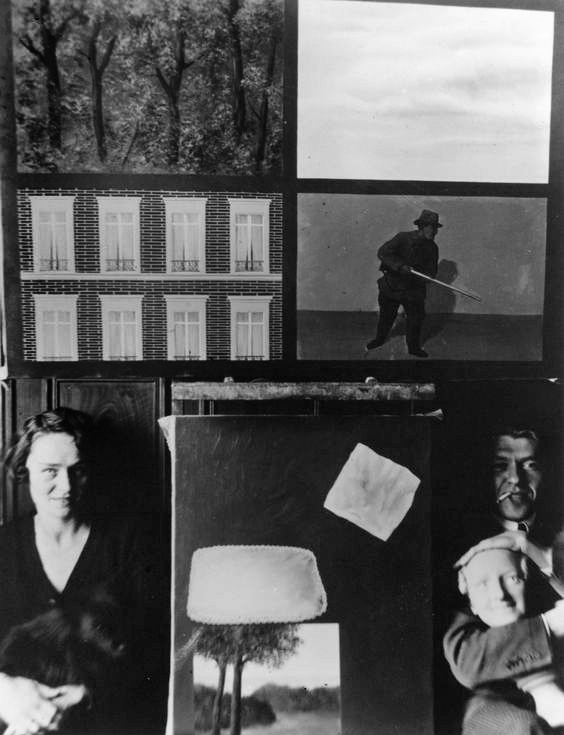 The production and titling of Magritte’s paintings and photographs was a collective and transformative process (undertaken with his group of friends), part of a reflective process that articulated the material conditions of a given situation (in this case, the Belgian Surrealist movement), in which the paintings and the photographs extend the possibility of being through an engagement with each other. For example, in The Death of Ghosts (1928) you really really have to look to try and understand what is going on within the picture frame. 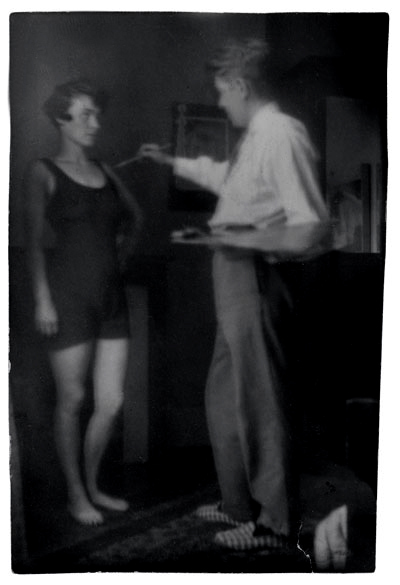 Even then, you wonder what is going on… the movement of the image, the darkness, the person lying in the background which is then linked to the painting The Apparition (1928) which uses the same silhouette of the figure, a trope that Magritte often uses when switching from photograph to canvas. 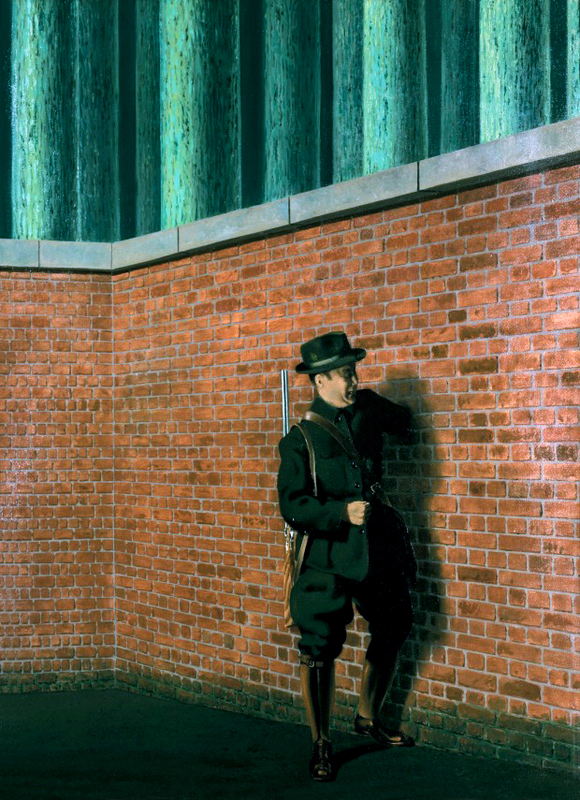 Throughout this wonderful exhibition you begin to formulate ideas as to how, firstly, the photograph is used as source material for Magritte’s art, as in the photograph for the painting Universal Gravitation (1943) where a man puts his hand through a wall (or is it the other way around, where the painting informs the photograph?) and, secondly, how the photograph is not used as a source material, but renegotiates the spatio-temporal dimensionality of the paintings. And becomes a new art work that stands by itself. And then you have to factor in the moving image: the sensibility of film, that movable feast of magic and masks, smoke and mirrors. By placing models, friends and paintings in the same photograph, Magritte’s images conflate time and space and ultimately challenge the concept of photography as a memory aid. Finally, there is so much mystery pres(t)aged within these photographs (the titles further compounding the dissolution of reality), that the already fragile grasp of the referentiality of the image is shattered. Go travel and see this exhibition, for it was a true pleasure to spend a variable amount of time in their intimate, visceral, and intellectual, embrace. Many thankx to Latrobe Regional Art Gallery for allowing me to publish the photographs in the posting. Please click on the photographs for a larger version of the image. Alfred Gell cited in Stanhope, Zara. “Photography in Focus,” in McColm, Donna (ed.,). “Love from Paris,” National Gallery of Victoria magazine. Melbourne: September/October 2017, p. 50. 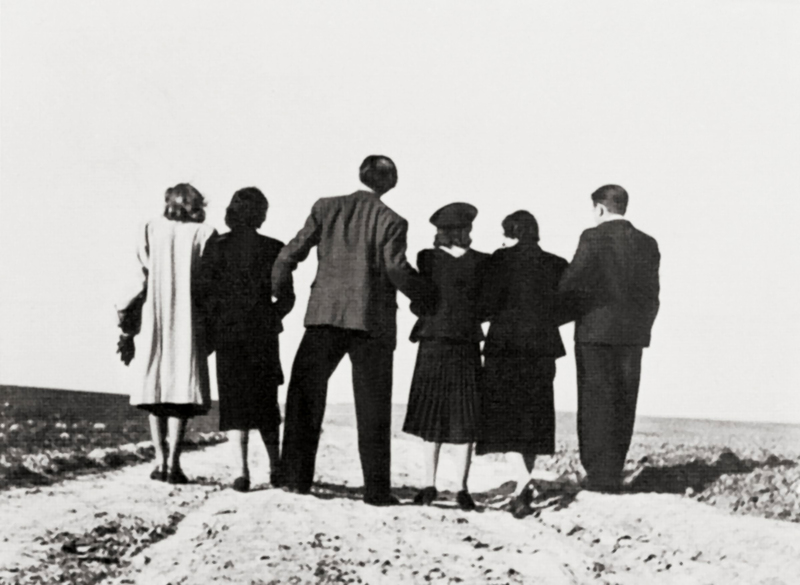 The Surrealists made abundant use of photography, and some even devoted themselves to it entirely. 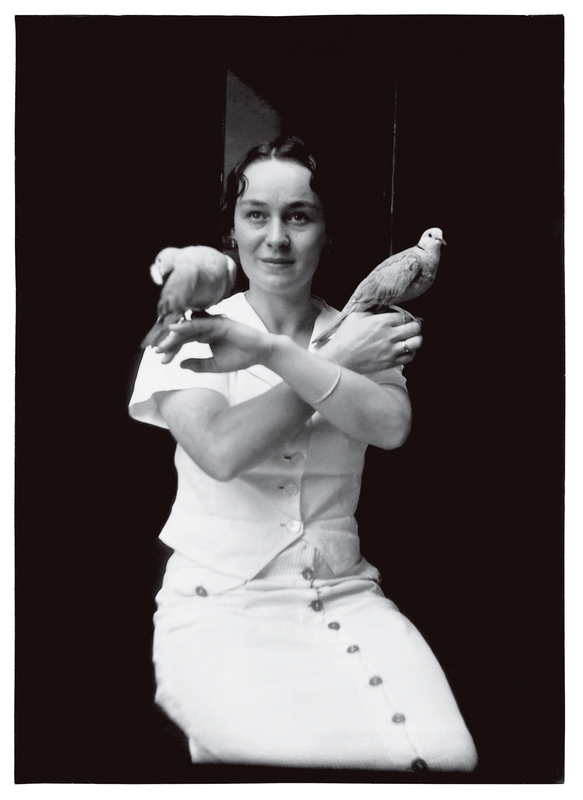 But Magritte never considered himself a ‘photographer’ – he reserved this practice for special moments and specific uses: family photos; models for paintings and advertising work; photos of paintings in progress; and scenes improvised with friends, similar to the skits he later filmed with a home movie camera. 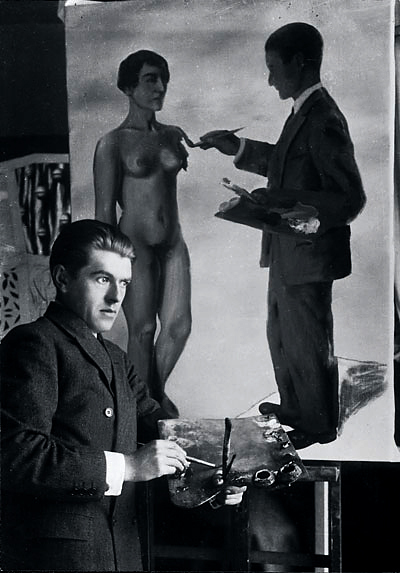 Nevertheless, Magritte’s photographs and films are closely related to his paintings and demonstrate a similar method in their grasp on reality. Far from being merely entertaining occasional images, they shed a familiar light on the painter’s thought and evidence the same investigation of the mysteries of the world. 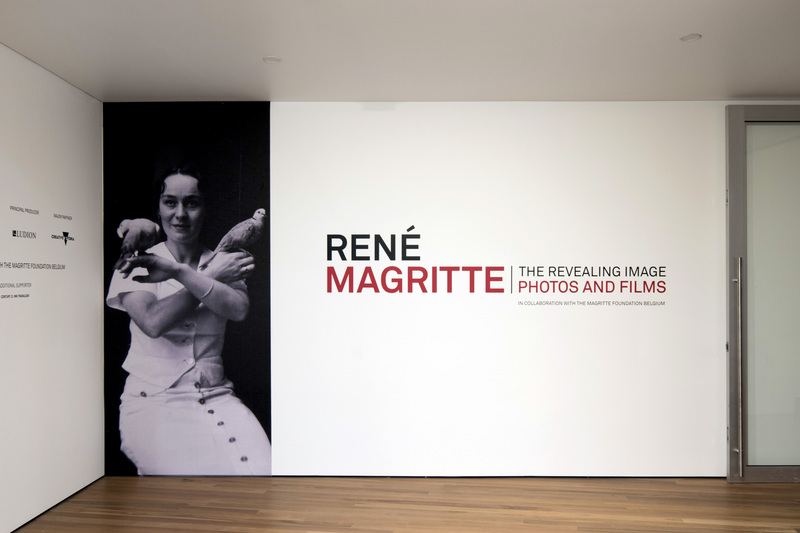 “The discovery of the photographs and films of René Magritte in the mid-1970s, more than 10 years after the painter’s death, and their subsequent appraisal and study have given us a look into a family album that reveals an intimate side of Magritte, independent of the biographical documents unearthed from his archives and those of people he was close to. 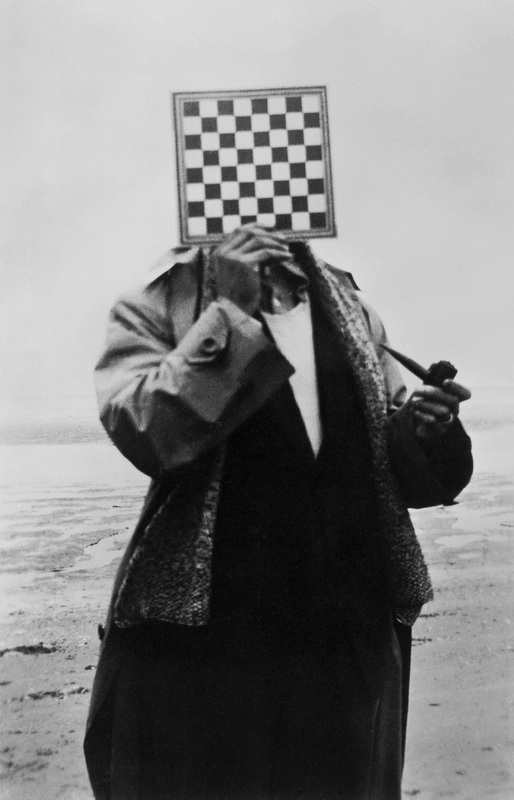 This discovery has also led to an investigation of Magritte’s relationship with these ‘other images’, for which he served as creator, director and model, and of his relationship with the mediums of photography and cinema, to which, in his experience as a painter, he assigned a role of both recreation and creation.” ~ Xavier Canonne. 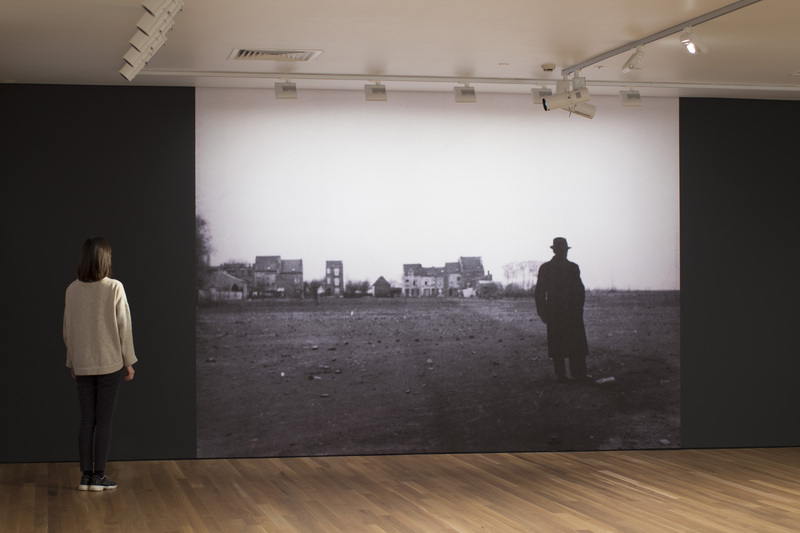 The exhibition René Magritte: The Revealing Image, Photos and Films consists of 132 original photographs from the archives of the painter and those closest to him, presented in six sections, and eight self-made films. 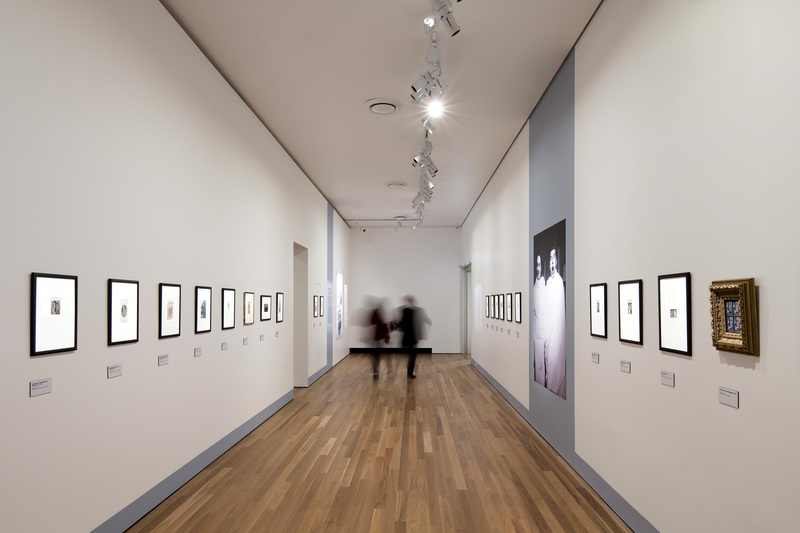 The photographs are organised thematically, eschewing strict chronology, each section introduced by a text, the individual photographs including a caption and a comment. They are accompanied by enlargements in the form of posters and, depending on the section, by reproductions of Magritte’s paintings or films, or by films which made an impression on him. 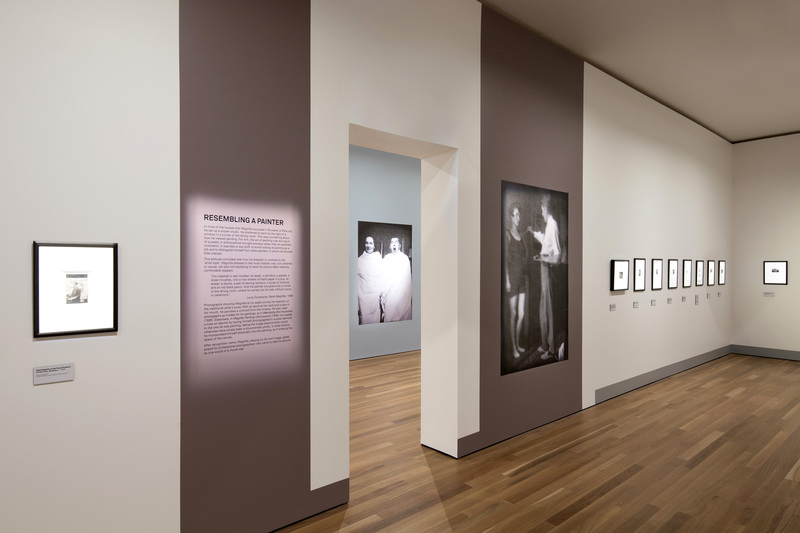 The photographs in this section, arranged chronologically, are devoted to Magritte’s family life. 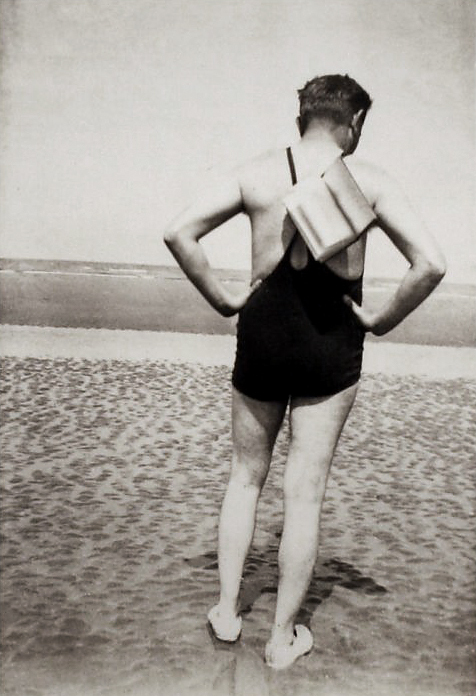 Snaps taken with his parents and brothers, his military service, the early years of his marriage to Georgette, their period of residence at Perreux-sur-Marne near Paris, their life in Brussels – all revealing the daily life of René Magritte. Organised chronologically, this section brings together photographs representing René Magritte’s other “family”, the Brussels Surrealist group with which the painter threw in his lot in 1926. 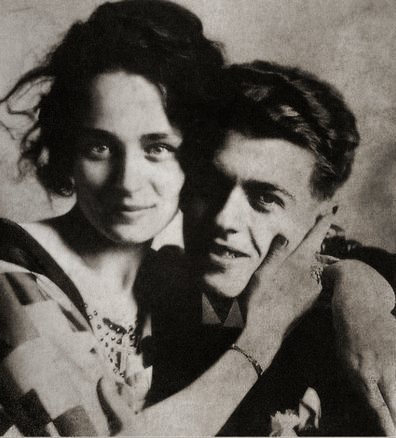 Paul Nougé, Marcel Lecomte, Louis Scutenaire, Irène Hamoir, Paul Colinet, Marcel Mariën, Camille Goemans and Marthe Beauvoisin are some of the characters who feature in these compositions, in many cases improvised “photographic tableaux” bearing witness to the intimate relationship between René Magritte and his immediate circle. This third section of the exhibition consists of photographs of René Magritte at his easel, covering the years from 1917 to 1965. They show the painter with works from different periods, taken impromptu or posing, generally in a suit, in the succession of houses where he never established a workshop, preferring to paint in his living-room. 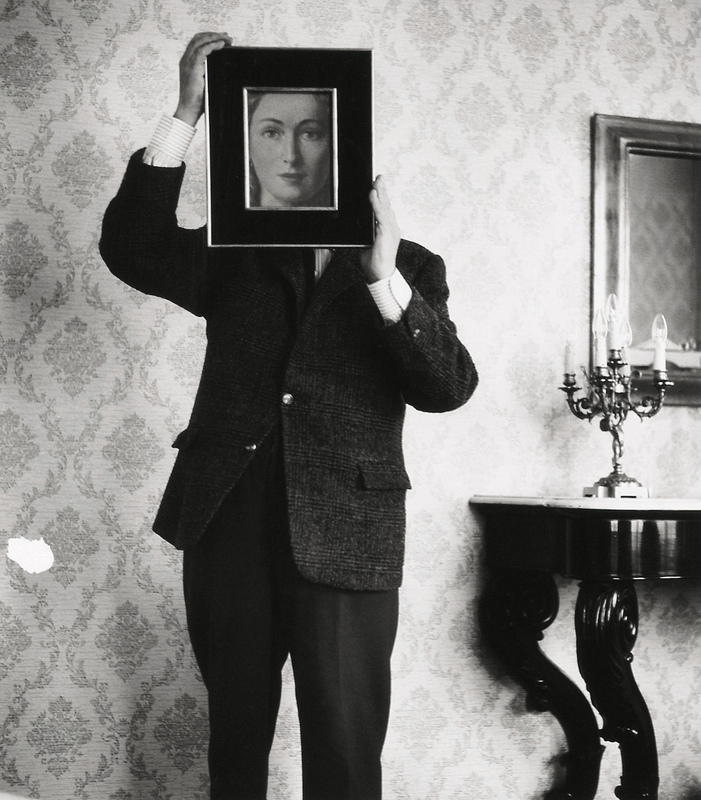 Working documents or “staged” photographs, they show how Magritte often tended to parody his work as a painter. This section of the exhibition comprises paintings by Magritte placed on his easel or forming the background of portraits of him and his wife. Essential paintings, some of which have been lost, provide the painter with a stage set into which he projects himself with his wife, going beyond documentary photography. 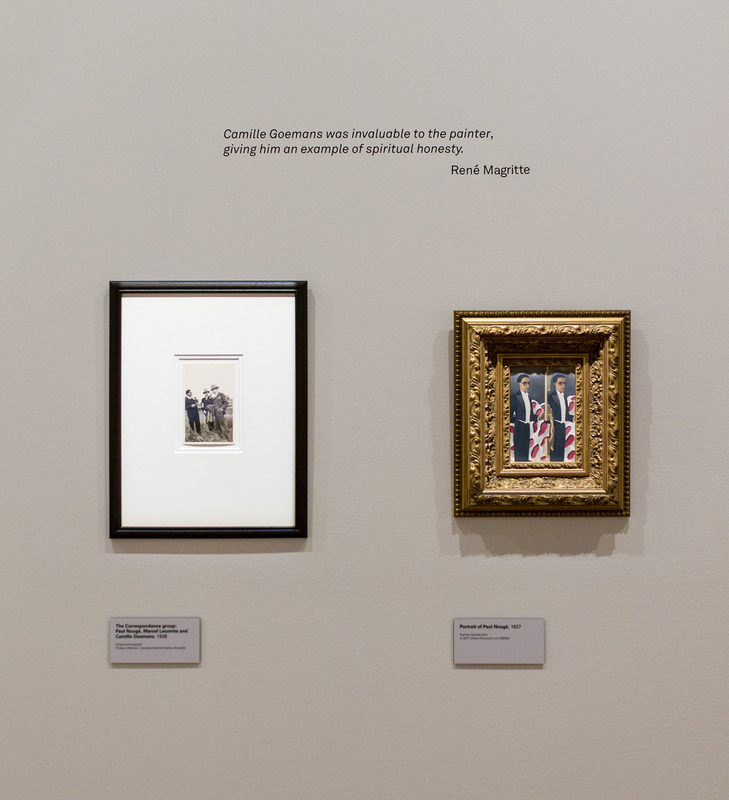 This section also includes a series of photographs which served as models for his paintings, featuring Georgette and René Magritte, Louis Scutenaire and various close friends – photographs directly connected with his works, which are presented in the form of reproductions. Magritte used the same procedure in the short films he made between 1940 and 1960, and extracts in television format or reproductions are shown alongside the original photographs. The cinema, more even than painting and to the same extent as literature, was a seminal influence of the work of René Magritte. As a child, he had been exposed to the first silent films and he tried to recreate their freshness and spontaneity in the short films he made, featuring his close friends. Magritte may still be posing in this section, but the emphasis is on entertainment. 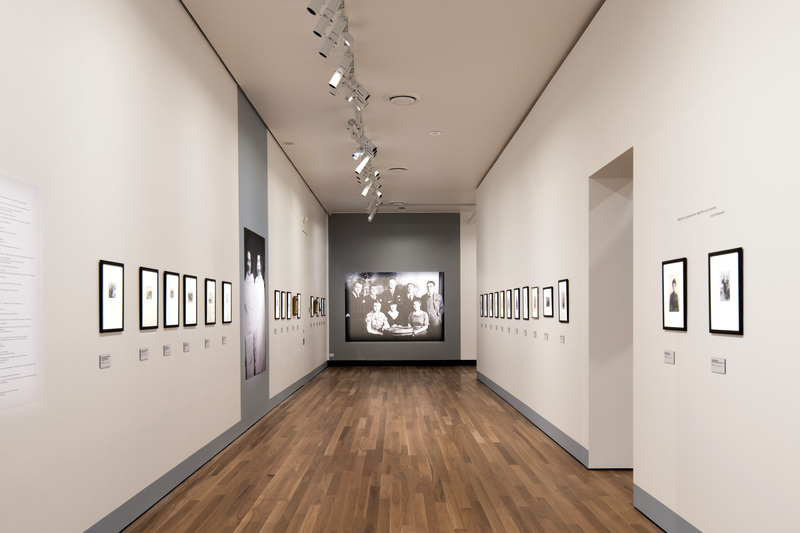 This section of the exhibition is accompanied by extracts from his own films, presented on the TV screens, and by images from films by directors he admired, such as Louis Feuillade with his celebrated Fantômas. This title of a celebrated painting by René Magritte opens the final section of the exhibition. 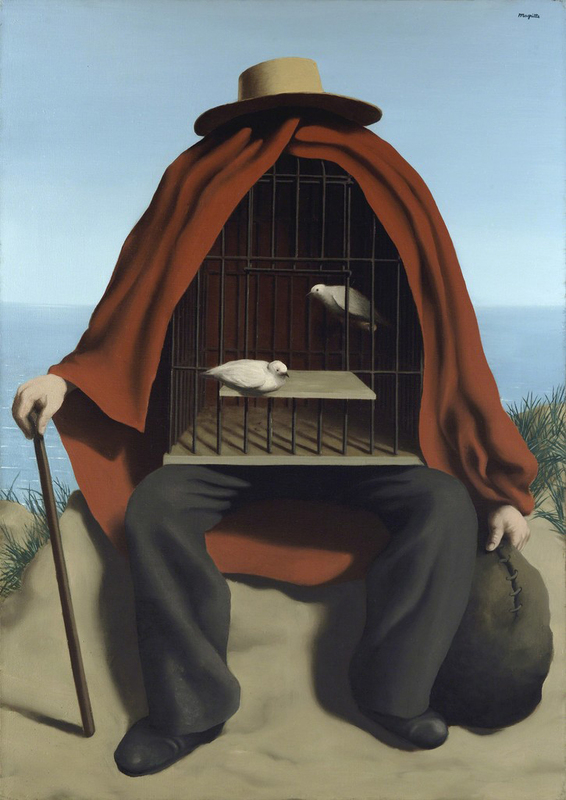 Consisting essentially of portraits of Magritte at different stages of his life, they sometimes depict him in dreamy mood, sometimes expressing amusement, generally with his eyes closed, focused inwards. 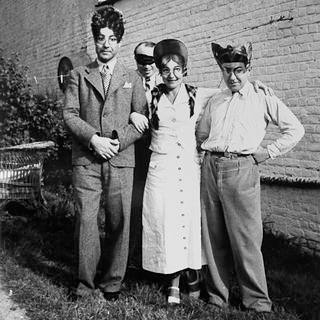 The section also includes photographs in which the painter and his friends mask their faces or turn away from the camera lens, prolonging in photographic mode his painterly research on the caché-visible (things hidden in plain sight). 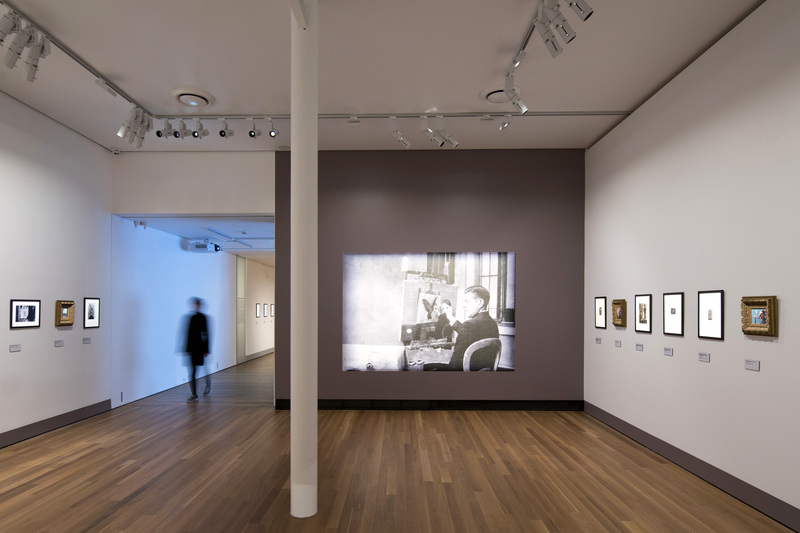 Installation view of the exhibition René Magritte: The Revealing Image at the Latrobe Regional Art Gallery with at left, Régina Bertinchamps, René Magritte’s mother by an unknown photograper, Nd; and at right, Léopold Magritte and Régina Bertinchamps, Lessines, 1898 also by an unknown photographer. 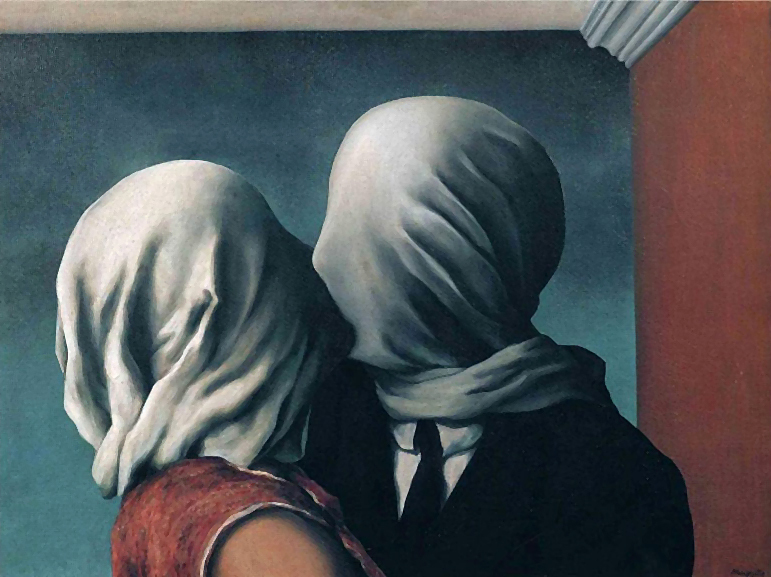 This is one of a small group of pictures painted by Magritte in Paris in 1927-28, in which the identity of the figures is mysteriously shrouded in white cloth. The group of paintings includes L’histoire centrale (The central story) 1927 (collection Isy Brachot, Brussels); L’invention de la vie (The invention of life) 1927-28 (private collection, Brussels); The lovers 1928 in the Australian National Gallery; and the similarly titled, similarly dated and similarly sized painting in the collection of Richard S. Zeisler, New York, in which the same shrouded heads of a man and a woman that appear in the Gallery’s painting attempt to kiss each other through their grey cloth integuments. The origin of this disturbing image has been attributed to various sources in Magritte’s imagination. 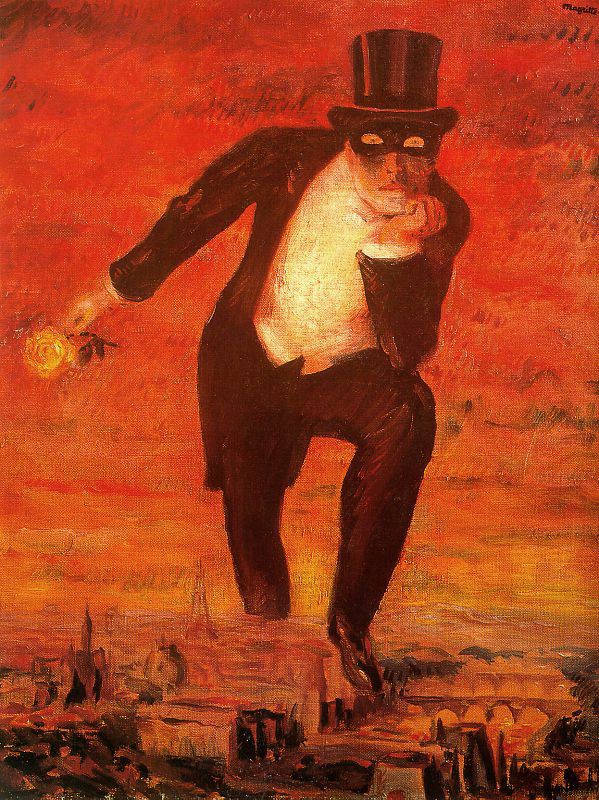 Like many of his Surrealist associates, Magritte was fascinated by ‘Fantômas’, the shadowy hero of the thriller series which first appeared in novel form in 1913, and shortly after in films made by Louis Feuillade. 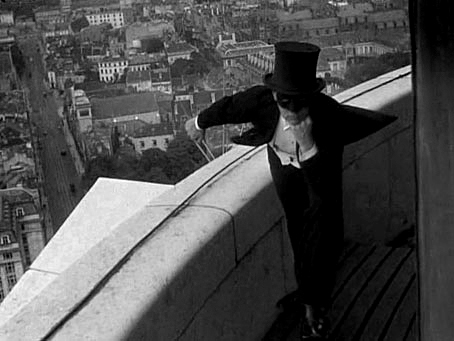 The identity of ‘Fantômas’ is never revealed; he appears in the films disguised with a cloth or stocking over his head. 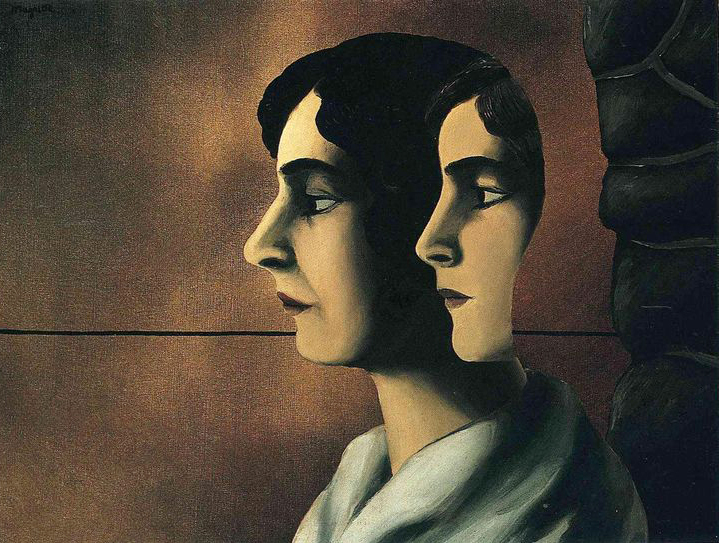 Another source for the shrouded heads in Magritte’s paintings has been suggested in the memory of his mother’s apparent suicide. In 1912, when Magritte was only thirteen years of age, his mother was found drowned in the river Sambre; when her body was recovered from the river, her nightdress was supposedly wrapped around her head. Michael Lloyd & Michael Desmond. European and American Paintings and Sculptures 1870-1970 in the Australian National Gallery 1992 p.173. 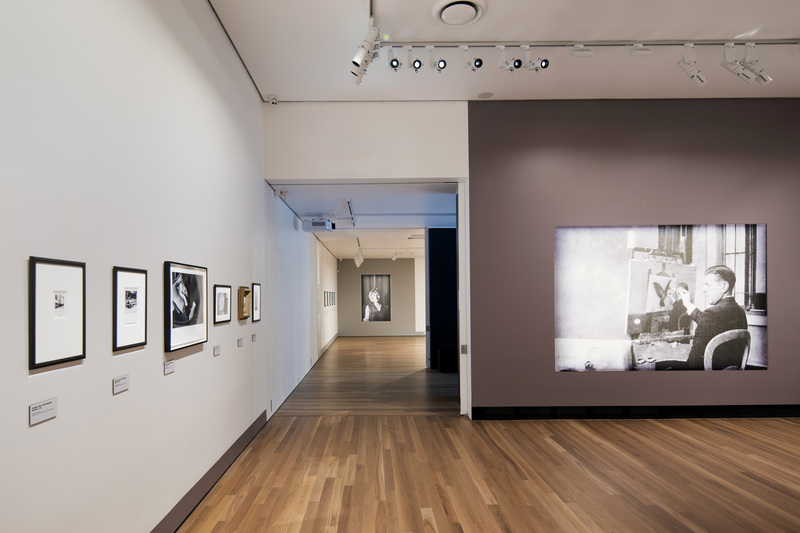 Installation view of the exhibition René Magritte: The Revealing Image at the Latrobe Regional Art Gallery with at left, René Magritte’s The Correspondance Group, 1928 (Paul Nougé, Marcel Lecomte and Camille Goemans), paired with René Magritte’s Portrait of Paul Nougé, 1927 at right. Magritte has set up his easel in the small courtyard leading to the garden on Rue Essenghem. 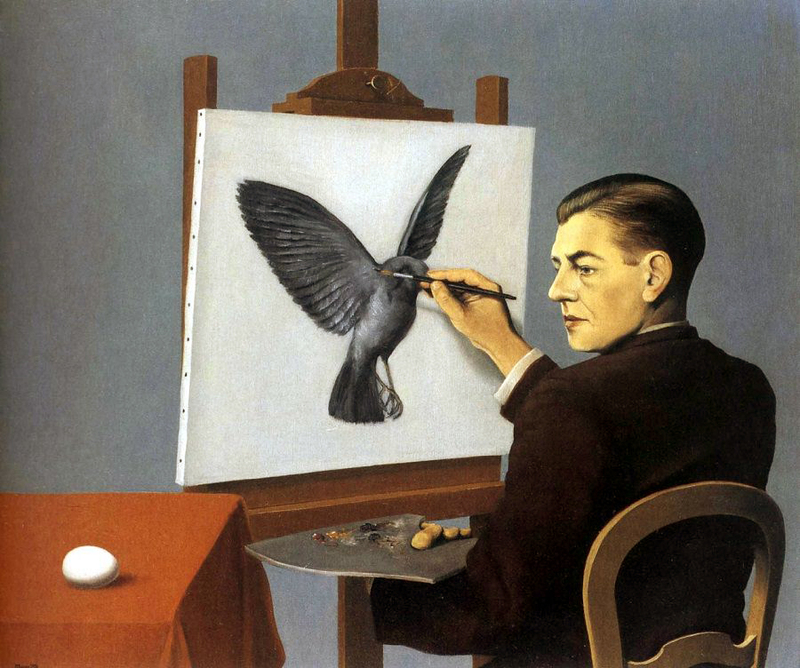 On it sits a completed painting, Clairvoyance, which represents Magritte seated in front of a canvas, brush in hand, his face turned towards an egg resting on a table covered with a tablecloth to his left. But the painted image in this photographic model is a bird with spread wings. 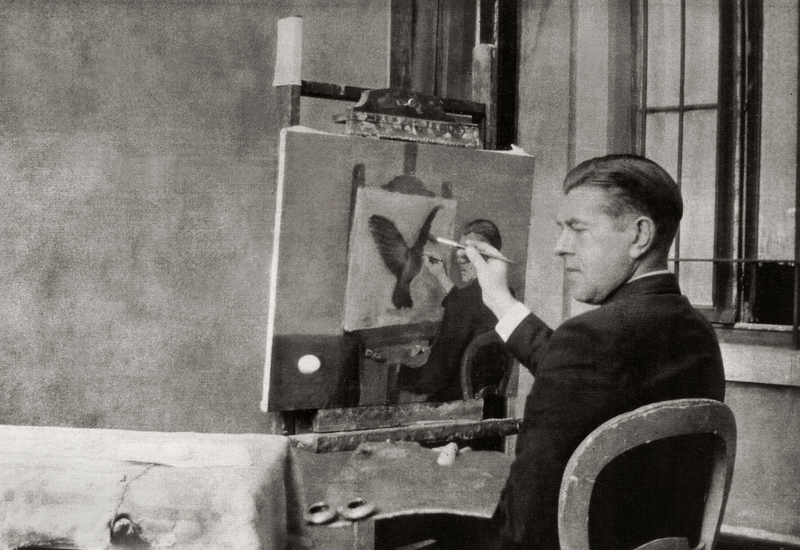 Magritte, in a perfect imitation – suit, palette, haircut and chair – is in turn seated in front of he painting, pretending to paint. 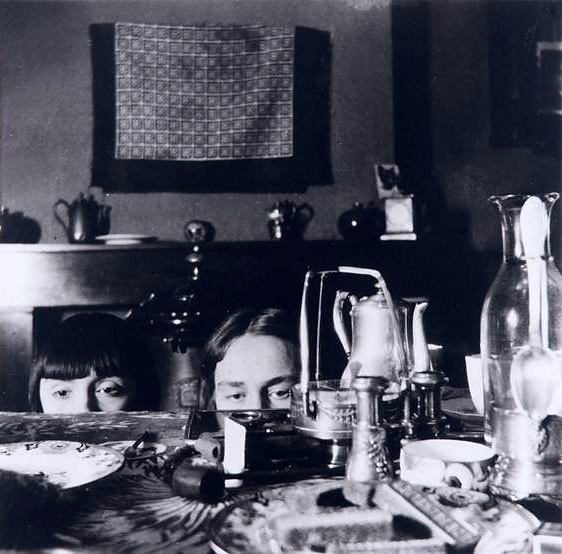 The photograph, taken on 4 October 1936 by young Jacqueline Nonkels according to instructions and staging established by Magritte, seems as much self-portrait as mise-en-abyme. It is the result of a different way of conceiving of photography, without trick shots or manipulation, of offering… a multiplying effect, an extension of what would otherwise have been merely a documentary image. Beyond the mise-en-abyme implemented by the interplay of the painting and its ‘model’, this photograph goes beyond the notion of document to lay claim to that of an intrinsic work. Xavier Canonne. 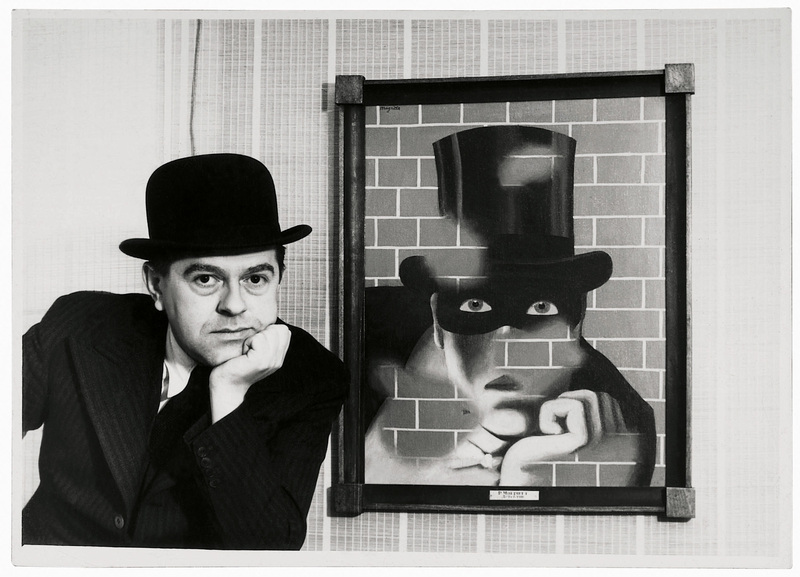 “The Resemblance of Painting,” in René Magritte: The Revealing Image, Photos and Films. LaTrobe Regional Gallery, 2017, p. 72. Xavier Canonne. 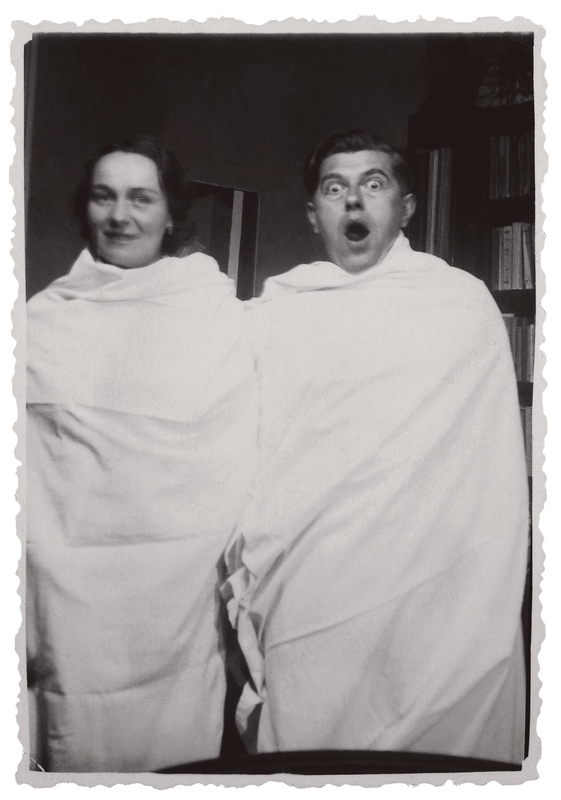 “Reproduction permitted or photography enhanced,” in René Magritte: The Revealing Image, Photos and Films. LaTrobe Regional Gallery, 2017, p. 98. Xavier Canonne. 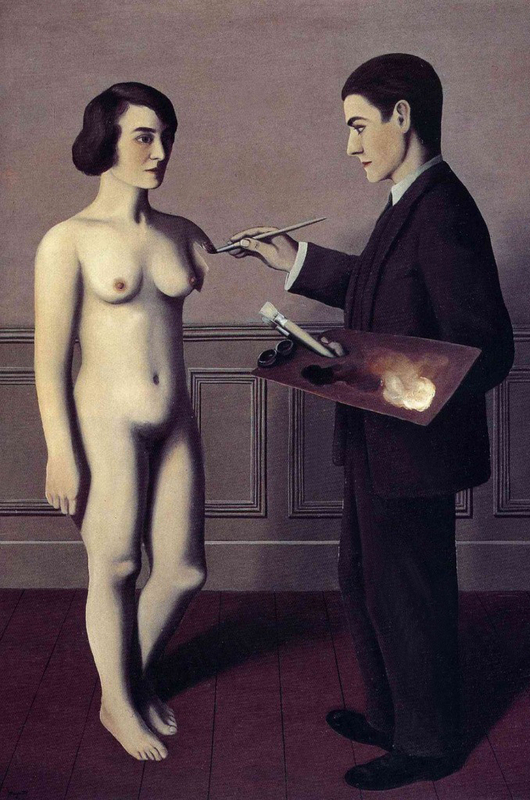 “Reproduction permitted or photography enhanced,” in René Magritte: The Revealing Image, Photos and Films. LaTrobe Regional Gallery, 2017, p. 106. René Magritte: The Revealing Image, Photos and Films is a world-first exhibition which provides stunning insight into the life, work and thinking of René Magritte, one of the world’s most important 20th Century artists. 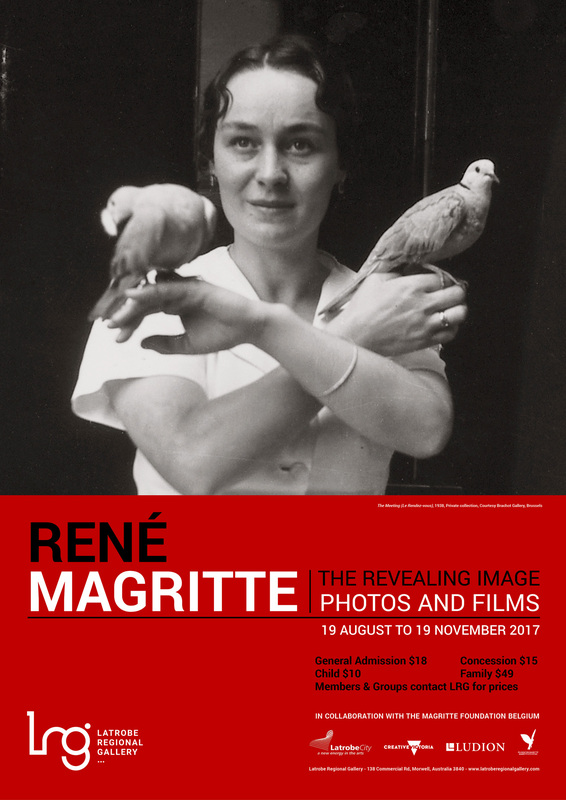 The exhibition, to be held at Latrobe Regional Galley in Morwell, Victoria, Australia from 19 August to 19 November 2017, features 130 original photographs by and of Magritte, his family, friends and fellow artists. It also includes eight self-made films which give a behind-the-scenes view of Magritte’s world. This exhibition, staged in collaboration with the Magritte Foundation Belgium. 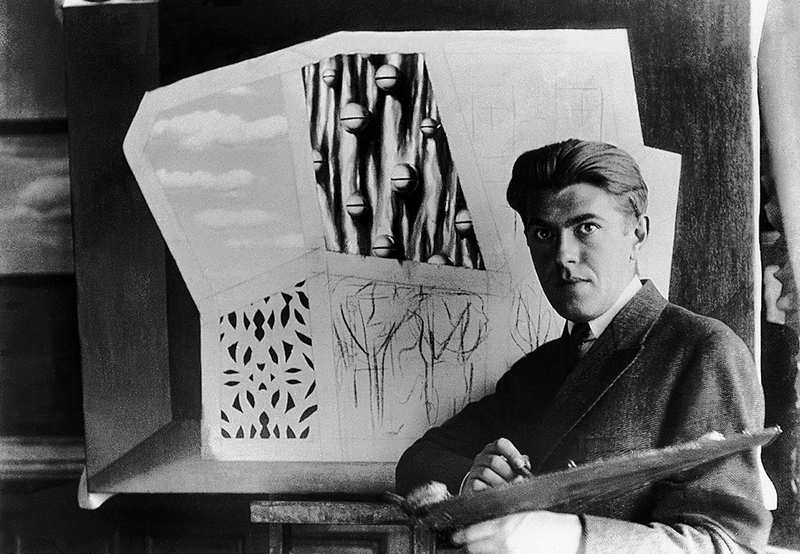 René Magritte: The Revealing Image, Photos and Films, marks the 50th anniversary of the Belgian Surrealist’s death. 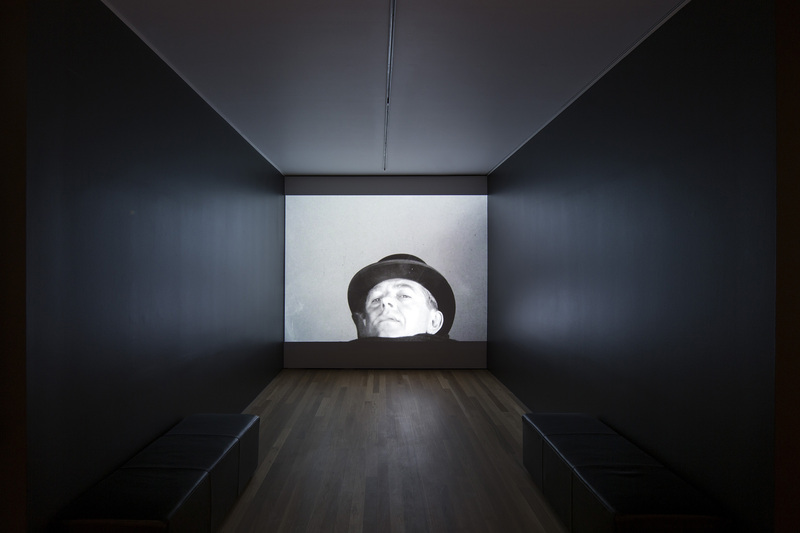 After its world-premiere in Morwell, René Magritte: The Revealing Image, Photos and Films will travel to Hong Kong, North and South America, and back to Europe. 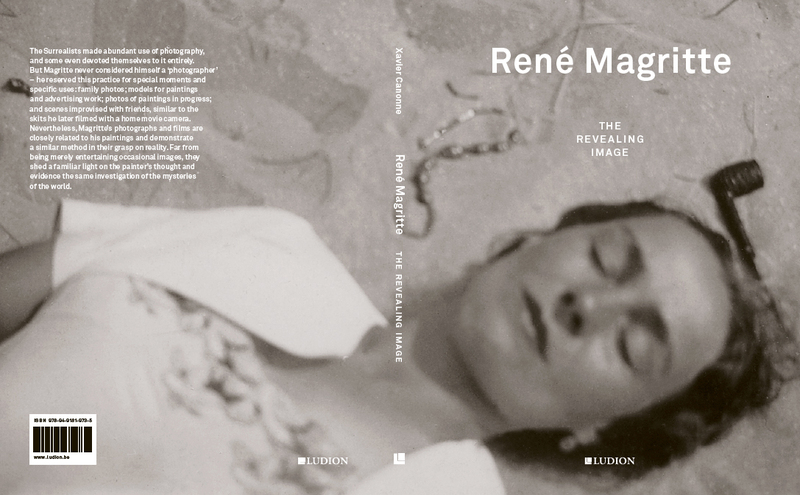 In conjunction with the opening of René Magritte: The Revealing Image, Photos and Films a book on the exhibition by Mr Canonne has been published by Ludion, distributed globally by Thames & Hudson. Xavier Canonne. “The imitation of photography. 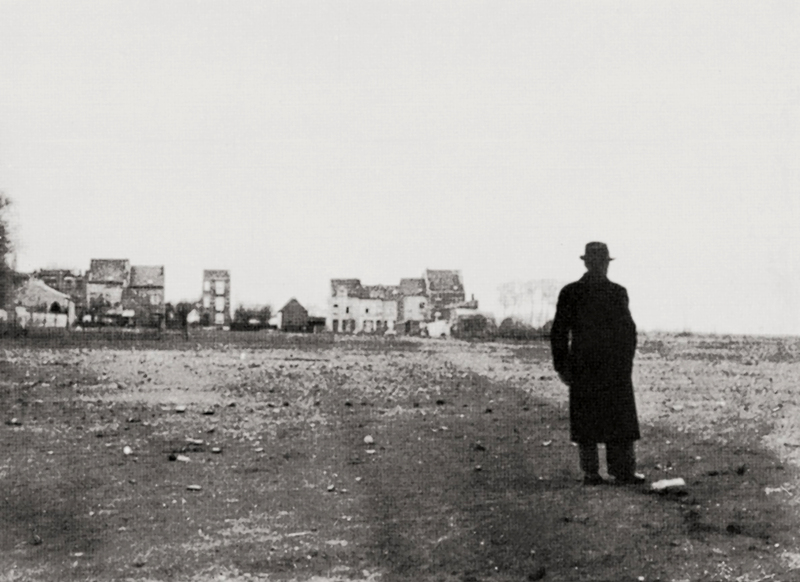 Magritte and the cinema[tograph],” in René Magritte: The Revealing Image, Photos and Films. LaTrobe Regional Gallery, 2017, p. 126. Louis Feuillade (1873 – 1925) was a prolific and prominent French film director from the silent era. Between 1906 and 1924 he directed over 630 films. He is primarily known for the serials Fantômas, Les Vampires and Judex. The Fantômas serial in 1913 was his first masterpiece, the result of a long apprenticeship – during which the series with realistic ambitions, Life as it is, played a major role. It is also the first masterpiece in what the modern critic, from both a literary and a cinematographic point of view, would later call “the fantastic realism” or the “social fantastic”. He is credited with developing many of the thriller techniques used famously by Fritz Lang, Alfred Hitchcock, and others. The series consists of five episodes, each an hour to an hour and a half in length, which end in cliffhangers, i.e., episodes one and three end with Fantômas making a last-minute escape, the end of the second entry has Fantômas blowing up Lady Beltham’s manor house with Juve and Fandor, the two heroes, still inside. The subsequent episodes begin with a recap of the story that has gone before. Each film is further divided into three or more chapters that do not end in cliffhangers. Éminence grise: a person who exercises power or influence in a certain sphere without holding an official position. In November 1924 he created the journal “Correspondance”, which published 26 pamphlets up to September 1925, in collaboration with Camille Goemans and Marcel Lecomte. In July 1925 he was expelled from the party. 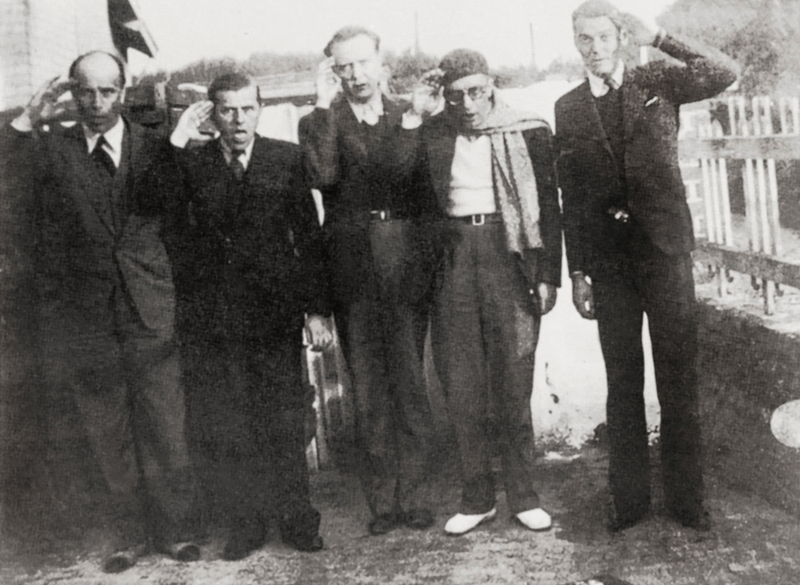 That same year Nougé met the French surrealists, Louis Aragon, André Breton and Paul Éluard, and together they signed the tract “La Révolution d’abord et toujours” (The Revolution First and Forever), and made the acquaintance of Louis Scutenaire in 1926. 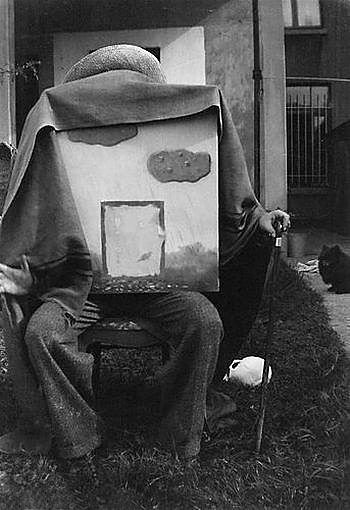 September of that same year marked the drafting of the constitution of the Belgian Surrealist Group that comprised Nougé, Goemans, René Magritte, E. L. T. Mesens and André Souris. 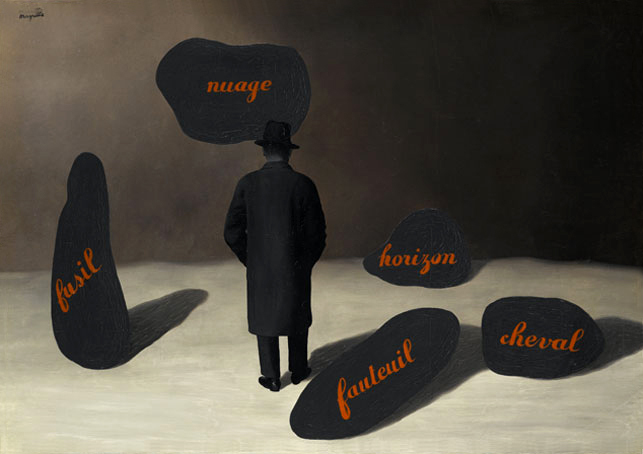 In 1927 Nougé composed plagiarised examples of a grammar book of Clarisse Juranville, illustrated with 5 drawings by Magritte. 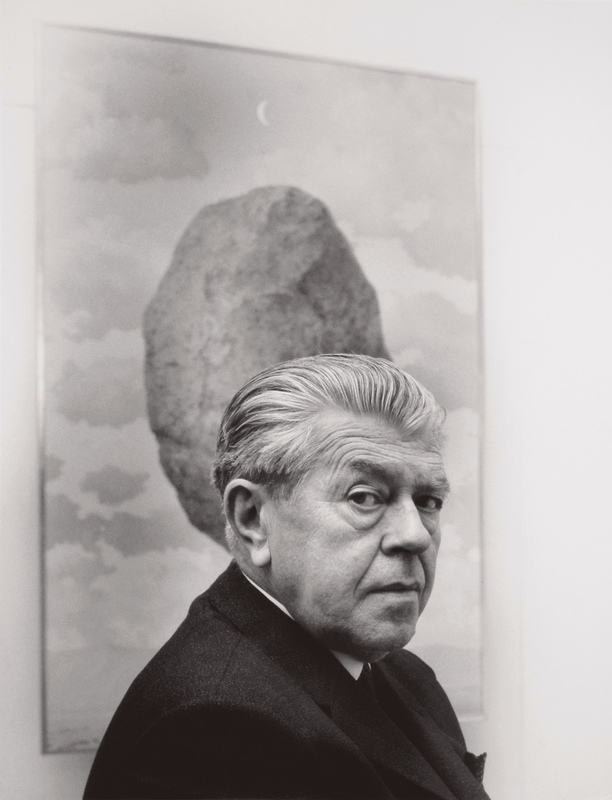 In 1928 he founded the magazine “Distances” and wrote the poem catalogue of a fur trader that was illustrated by Magritte entitled “Le catalogue Samuel” (re-edited by Didier Devillez, Brussels, 1996). 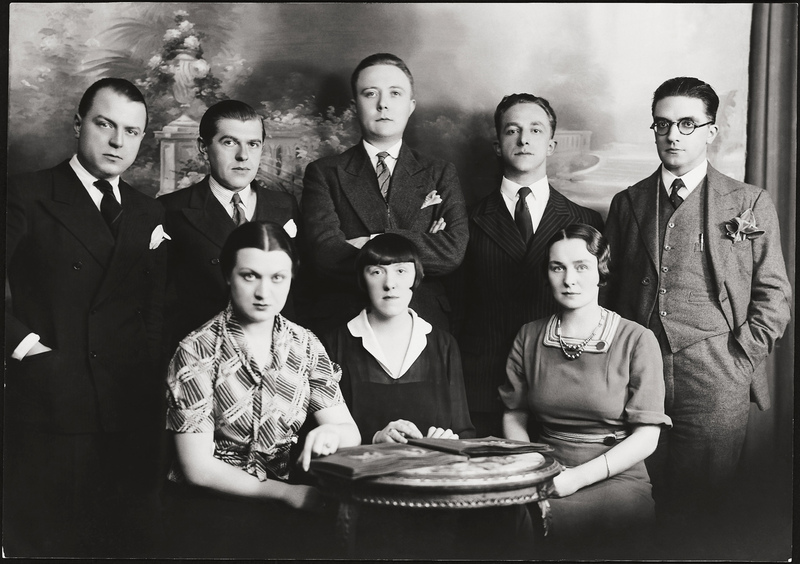 He also wrote the preface of a Magritte exhibition at the gallery “L’époque” (signed by his ‘accomplices’ Goemans, Mesens, Lecomte, Scutenaire and Souris) and delivered in January 1929 to Charleroi – a conference on the accompanying music to a concert conducted by Souris and an exhibition of Magritte (“La conférence de Charleroi”, published in 1946). 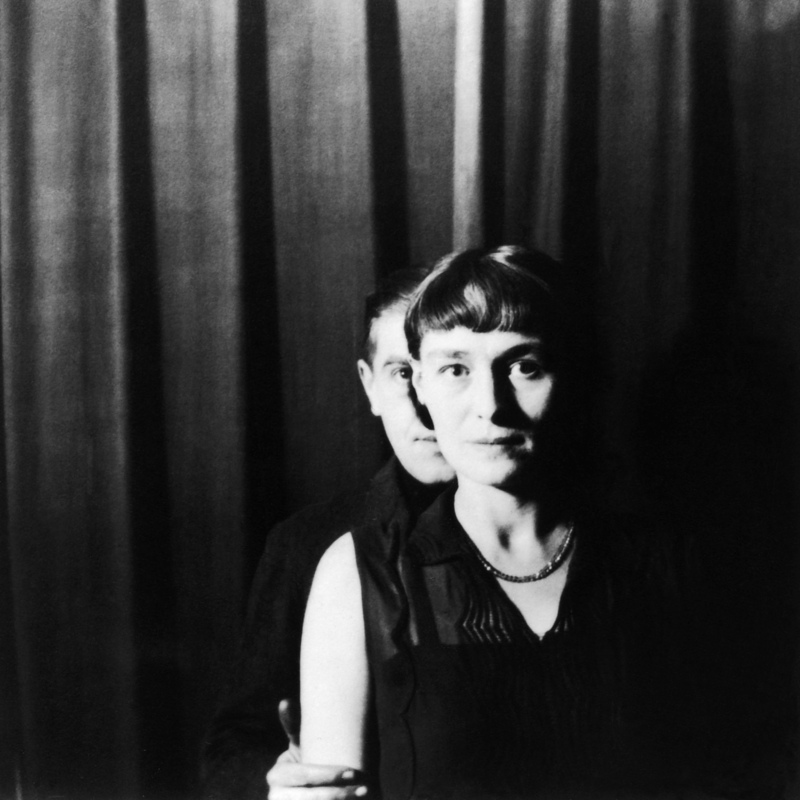 Between December 1929 and February 1930 Nougé created 19 photographs, unpublished until 1968, under the title “Subversion des images”. These photographs have been displayed notably, and most recently, at the Edinburgh Art Festival 2009. 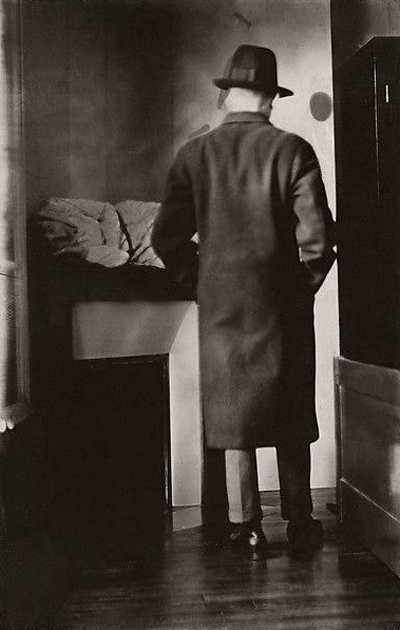 In 1931 he wrote the preface to an exhibition which followed the return of Magritte to Brussels. Extracts from “Images défendues” were published in 1933 in issue number 5 of “Surréalisme au service de la Révolution”. In 1934 Nougé co-signed “L’action immédiate” in “Documents 34”, edited by Mesens. In 1935 “Le Couteau dans la plaie” (‘The Knife in the Wound’) was published and in 1936, René Magritte ou la révélation objective was published in “Les Beaux-Arts” in Brussels. In that same year, Nougé, along with Mesens, organised the exclusion of Souris from the group. Nougé was mobilised in 1939 in Mérignac then Biarritz, during World War II, as a military nurse. 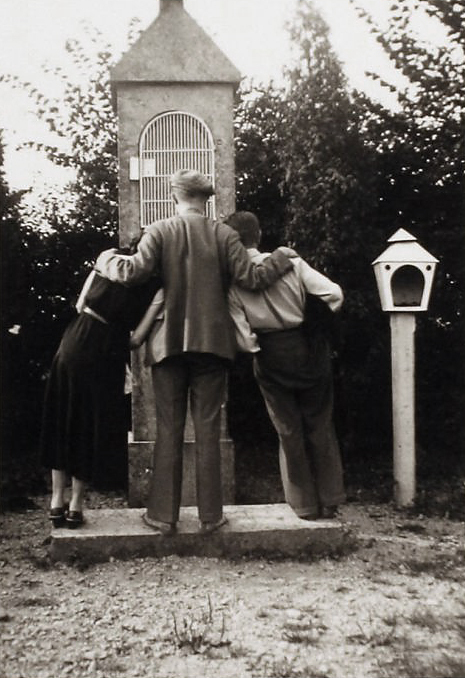 In 1941 Nougé prefaced an exhibition, quickly closed by the occupying forces, of photographs by Raoul Ubac in Brussels L’expérience souveraine (The Sovereign Experience). 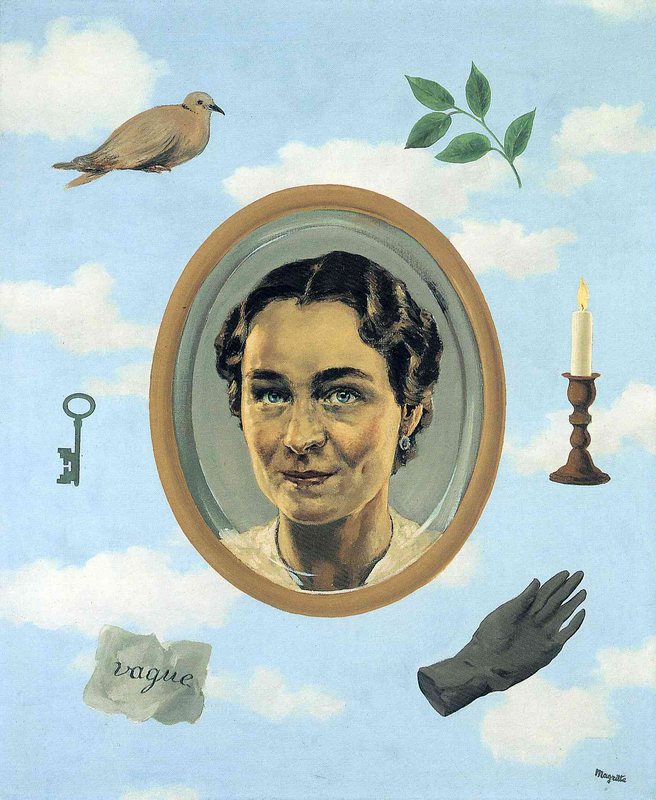 In 1943 he published the complete text of René Magritte ou Les images défendues. 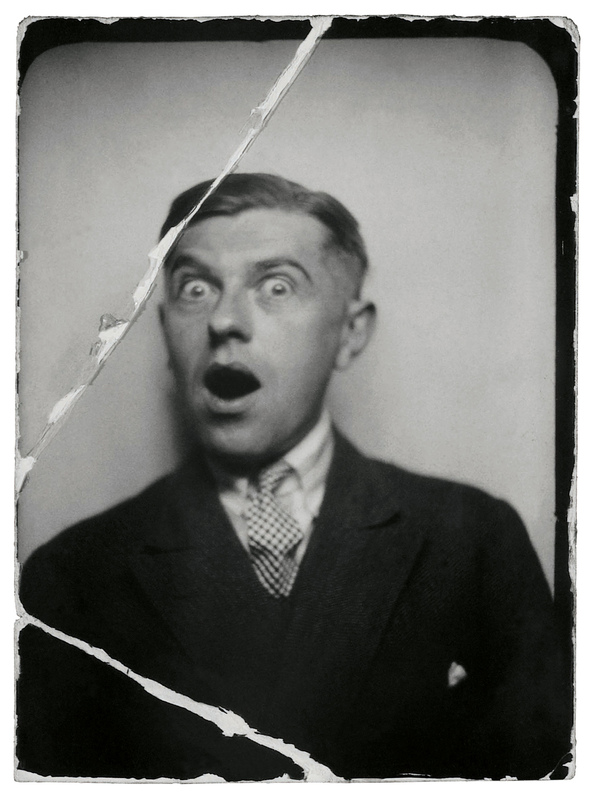 In January 1944, under the pseudonym of Paul Lecharantais, he prefaced a new exhibition of Magritte that was criticised by the collaborators of nazism. 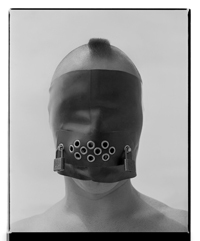 In 1945 Nougé participated in the exhibition “Surréalisme” organised by the Editions La Boétie de Bruxelles gallery. 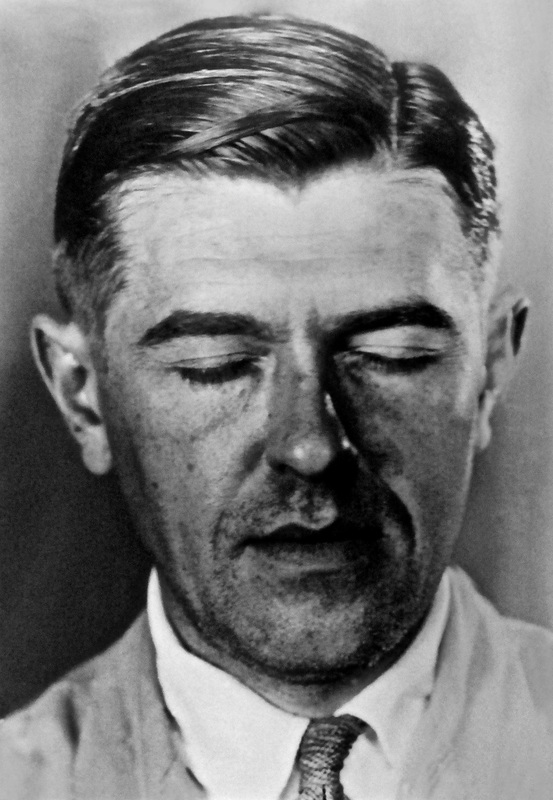 In 1946 he published La Conférence de Charleroi and, under the title Élémentaires a preface for the exhibition of Magritte “Le Surréalisme en Plein Soleil” (Surrealism in Full Sunlight) at the Dietrich gallery. The photographers Harry Shunk (German, 1924-2006) and János Kender (Hungarian, 1937-2009) worked together under the name Shunk-Kender from the late 1950s to the early 1970s, based first in Paris and then in New York. Shunk-Kender photographed artworks, events, and landmark exhibitions of avant-garde movements of the era, from Nouveau réalisme to Earth art. They were connected with a vibrant art scene that they captured through portraits of artists and participated in through collaborative projects.